Do you want to see advanced reporting on your OptinMonster campaigns? Google Analytics provides detailed data on how your campaigns are performing. This guide will show you where to find OptinMonster impression and conversion statistics from your Google Analytics account. NOTE: This guide assumes that you have already connected each of your campaigns to Google Analytics. If not, please follow our Google Analytics guide first. To begin, log into your Google Analytics account. Once logged-in, navigate to Behavior » Events » Overview. To refine the information returned, select Top Events instead of Overview. On the next screen you will see a lot of Impression data. That is, you will see all the times your campaigns have been viewed. To further refine the data you can choose a specific campaign to filter the data by. Here we’ve selected the Campaign Five campaign to filter. By selecting the name of a campaign we see the impressions and conversions of that particular campaign. Would you like to see the aggregate data, that is, the total information for all of your campaigns? 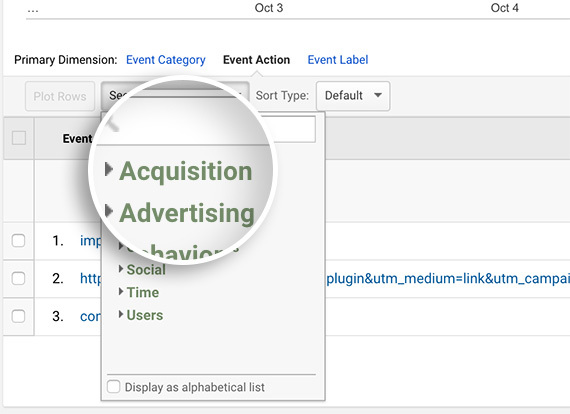 Start by navigating to Behavior » Events » Top Events in Google Analytics. Click on the Secondary dimension button to reveal a list of additional data points that can be added to the table. From this list, choose Behavior which will reveal a sub-menu of options. Lastly, choose Event Action. This will cause the page to refresh and now the numbers for Conversions and Impressions will be added to the table for each of your campaigns. The table will now contain two rows per campaign one with the number if Impressions and one with Conversions. Would you like to compare your campaigns’ data between different pages on your website? 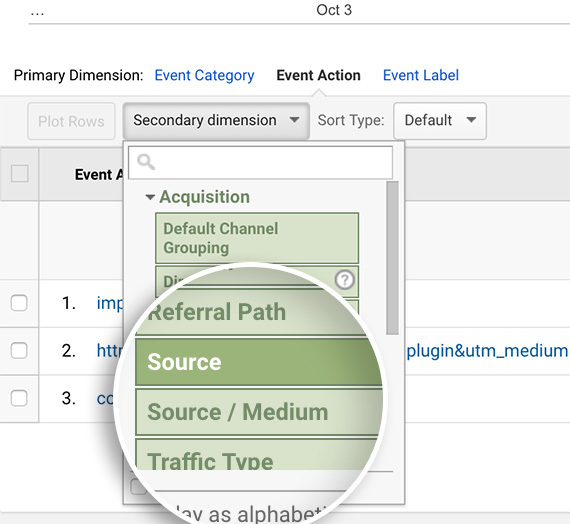 Navigate to Behavior » Events » Pages in Google Analytics. The table on this page breaks down the events from your campaigns by the paths of the pages on which they appear. Note: The paths used here are the portion of the URL after the domain name beginning with a forward slash. For example, http://mydomain.com/blog will be displayed here as just /blog. This means your website’s homepage will be represented by just a forward slash. From this page you can further break down the data into Impressions and Conversions following the same steps as in Step 3 above. First click on the Secondary dimension button. Then select Behavior from the list that appears there. Then choose Event Action from the list of available dimensions. Now there will be two rows for each page in the table, one for Impressions and one for Conversions. Would you like to compare your conversions based on traffic source? You will see the page section refresh with a graph of total events amongst all of your campaigns and below that a table listing the number of events for each campaign. To compare conversions and impressions with the traffic source, first click on Event Action at the top. Then, click on the Secondary dimension button to reveal a list of additional data points that can be added to the table. Then select Acquisition from the list that appears. Finally, select either Source or Source/Medium. This will add an additional column to your list so you can compare the events from different sources. Now you’ve learned how to view basic OptinMonster reports in Google Analytics. To generate reports customized to your marketing goals check out our guide on Creating OptinMonster Event Goals in Google Analytics. Q: What is the “Reauthenticate with Google Analytics” button? And why is it there? A: That button appears if there is ever an interruption with OptinMonster’s communication with Google Analytics. This interruption prevents any conversion analytics from being recorded. You’ll see an error message if there is any problem communicating with Google. This interruption can occur if Google Analytics account passwords are changed, user permissions are updated, or other reasons from Google. To reconnect, you can click Reauthenticate with Google Analytics. If your Google Analytics token is missing, just click the Generate Authentication Code button. Choose the Google Account that has access to this site’s Google Analytics, then click Google’s blue Allow button. You will then be given a code. Copy and paste that code into the field in OptinMonster called Authorization Token. Give the Account Connection a label (ex: “MySite.com’s GA Connection”). After those fields are filled, you can then press the Reauthenticate with Google Analytics button. Q: How do I track conversions if I’m using custom HTML or Canvas? A: For more information about how to track conversions with OptinMonster’s Canvas technology check out this guide. Q: What information is stored about each event? A: Each event has three attributes, the category, action, and the label. Label: The campaign’s ID. This will be unique to each campaign and will never change even if the campaign’s title is changed.